I'm more interested in the latter, but are either of these claims accurate? TL:DR This claim is based on a single scientific paper, and the conclusion in the infographic is exaggerated. 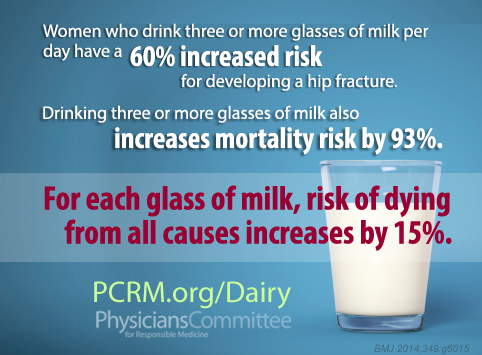 The paper cited in the more detailed post on Physicians Committee for Responsible Medicine is BMJ 2014,349:g6015 "Milk intake and risk of mortality and fractures in women and men: cohort studies", published in the theBMJ (formerly British Medical Journal). theBMJ is a respected peer-reviewed scientific publication. In the experiment described in the paper, a very large number of Swedish men and women were asked questions about their milk intake (and other dietary habits), and then followed up 11-20 years later. 93% more of the women taking three or more glasses of milk a day had died, compared with the group that were taking less than one glass per day. In women the adjusted mortality hazard ratio for three or more glasses of milk a day compared with less than one glass a day was 1.93 [...]. For every glass of milk, the adjusted hazard ratio of all cause mortality was 1.15 [...] in women and 1.03 [...] in men. So the headline figure is in fact true. However the authors of the paper specifically note the limitations of their studies, and caution against interpretations of the kind in the infographic. The study is observational, which means that no attempt was made to establish whether the milk caused the mortality rather than being correlated with it. There is a risk of 'reverse causation phenomena', essentially when those with a condition thought to be improved by drinking milk increase consumption of it, causing a correlation between high milk consumption and that condition. "even though the results were adjusted for some aspects of socioeconomic status (education and marital status), additional nuances may not have been adequately captured by our observational study design." It should be noted that the Physicians Committee for Responsible Medicine is largely defined by its advocacy of a Vegetarian/Vegan lifestyle. Not the answer you're looking for? Browse other questions tagged nutrition milk . Does drinking milk make people produce more phlegm? Does homogenized milk pose a health risk?